AJ comes to his room. He saw Guddan outside the house when she followed him. He says I have to hide this secret. The woman comes downstairs and dances. AJ comes downstairs. He says I asked you not to come here. Everyone comes. Gudddan takes off ghunght. She says why did you come running? And who were you asking not to come here? Tell us what is your relation with her? AJ leaves. Saru says I think Guddan is right. Perv sends video of Siddhi burning his hand. He says I didn’t want to send this but I wanted to show you my love was real. If your wife abuses you.. You deserve to love someone in your life. Durga says where did AJ go in anger? AJ says to bring the truth here. He brings in the woman. He says I have been meeting her all this time. She takes off her ghugat. AJ says this is what guddan was tryin to show you. Dadi says you already have a wife. Guddan says don’t say anything now. If he wants to live his life with her not me.. I will not come in his way. AJ says don’t do this drama. Guddan says you are still lying. Guddan says when someone acts in front of me I know. Because I am an actor. She says don’t fool us anymore. We all know she isn’t that woman. That woman brought shine in your eyes. I deserve to know truth not this. she leaves. Kaushaliya says you saw revati how his wife abuses him. He really loves him. You should all. She says no its between them. Kaushaliya says as a human call him please. Revati calls perv. Saru says you wont pick this phone you have to use her against Guddan. Saru says we have to make them fight each other. Guddan comes to saru and says here are a few breakup cards you might need. You will have nothing in the end. Guddan says please leave. SAru says I am on your side. I always want to help you. Guddan says but your ideas are useless. Durga says wow Guddan. AJ brought that girl home and you are not accepting it? Open your eyes and see the third person in your married life. You couldn’t be a good wife or MIL. Precap-Guddan brings the woman home. She takes off her ghunghat. Everyone is dazed. 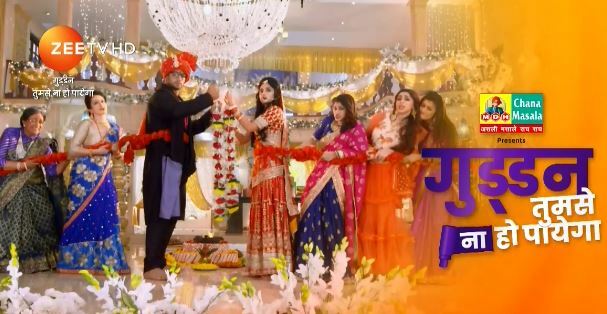 The post Guddan Tumse Na Ho Payega 14th March 2019 Written Episode Update: AJ brins the woman home appeared first on Telly Updates.